Czech Republic’s Katerina Siniakova leveled the tie at two matches apiece after a 6-4, 6-2 singles victory over Mihaela Buzarnescu in one hour and 26 minutes, giving her country hope that they would be able to keep their Fed Cup winning streak alive. But Siniakova and her regular partner Barbora Krejcikova, the No.1 and No.2 doubles players in the WTA rankings, were stunned by Begu and Niculescu, 6-7(2), 6-4, 6-4, in an incredible, grueling, two-hour and 53-minute live-rubber doubles match, to put Romania into the Fed Cup final four for the first time. In the first singles match on the second day of the tie, Halep needed to serve for the match twice after failing to close at 5-2 in the final set, but got the job done on her second time of asking. The Romanian had two fewer winners than Pliskova, but the Czech was undone by 62 unforced errors throughout the clash, which was 24 more than the more steady Romanian. The players exchanged breaks in the first game, but after that, Halep did not face a break point in the rest of the opening frame, while Pliskova faced three break points in her next four service games. Halep broke through at 4-4, where an error-prone Pliskova dropped serve to give Halep a chance to serve out the set. At 5-4, Halep quickly raced to triple set point, but fiery forehands by Pliskova pulled the Czech back to deuce. A backhand winner down the line gave Halep a fourth set point, but that too was saved. But a fifth set point came Halep’s way after a series of strong forehands, and Halep finally banked the set there, after a Pliskova backhand flew wide. Pliskova got off to a hot start in the second set, breaking Halep at love for a 3-1 lead after the Romanian’s backhand went awry. Halep climbed back on serve at 4-3 before Pliskova broke the Romanian once more, to serve for the set at 5-3. However, strong returning by Halep allowed her to break and pull back on serve again. At 5-5, Pliskova saved three break points before firing a backhand winner to hold for a 6-5 lead. That game proved to be pivotal, as Halep was unable to convert a game point, and then finished two straight points with backhands into the net to let Pliskova level the match at one set apiece. 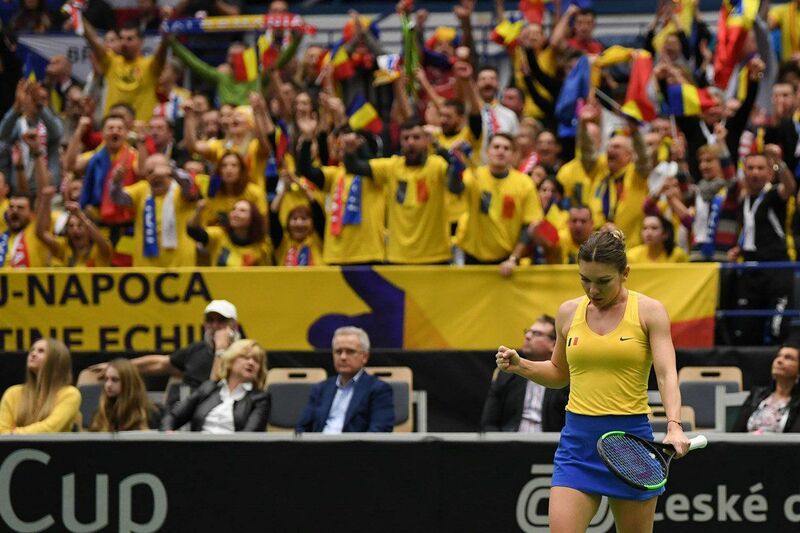 Halep and Pliskova broke each other to love in the first two games of the decider, as the intensity of the Ostrava arena became palpable. It was Halep who handled the pressure best at first, slamming a backhand winner to break again for 3-2, and then working her way through a protracted game to attain a second break and a 5-2 lead. Serving for the match, Halep hit a clutch of errors to drop serve. The Romanian held a match point on Pliskova’s serve in the next game, but the Czech survived to hold for 5-4. In the next game, though, Halep was unfazed, and moved to a second match point with an ace. There, a wide forehand return gave Halep a well-earned win. French Open champion Halep, who has vowed to win a first Fed Cup for her nation before she retires, had dug deep to defeat Pliskova before Siniakova ran out a comfortable 6-4 6-2 winner over Buzarnescu.